The unlikely pairing of Spaniard, Federico Garcia Lorca and Canadian composer and singer, Leonard Cohen, spark questions of how two highly individualistic compositional processes can be at all similar. Along with us, you will discover how the beauty in Cohen’s melodies evoke the foundational structure that musically support Lorca’s poetry, forming a new expression unexplored before in either canon. 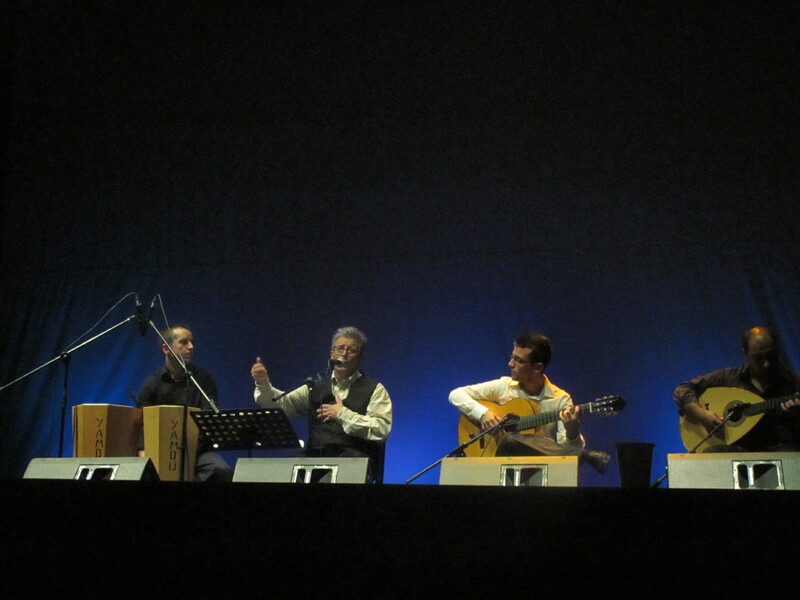 Fernando Barros, also a composer and singer, has a unique capacity to hear the innate musicality inherent in Spanish prose and poetry. His epiphany for creating this program came about while researching the profound influence Garcia Lorca and flamenco music had on the songwriter, Leonard Cohen. His metamorphic reveal consists of, not merely translating Cohen’s lyrics into Spanish, but readily adapting Lorca’s poems to the melodies of Cohen, like a glove coupled to a hand. In “Take This Waltz,” Leonard Cohen reveals his gratitude to Federico Garcia Lorca by putting the clothes of his music to Lorca’s poem, “Poet in New York.” This collaboration, despite the separation of several decades and continents, can best be seen as a synthesis of the spiritual union of their two paths. Fernando’s metaphors above are a striking example of how to approach the age-old question as to the sources of inspiration and creativity. His own compositions of the past decade reveal the inherent musicality found in the works of the writers and poets of Spain, reflected in a “beautiful voice, low in register, but with a clarion brightness to it, and beautiful diction.” His vocal resonance is uniquely suited to the subtleties required of melodic inflection and phrases. Beginning with “Suzanne,” Fernando has begun to reveal the natural rhythms, tonalities and sentimentalities of Lorca and Cohen and ‘officiates at the marriage of the two voices.’ Adding his own, he realizes the essence of exploration, thereby concretizing the ephemeral quest for the source of inspiration and creativity. Flamenco itself is a synthesis of Mediterranean musical epochs and genres, ranging from before the time of the Visigoths, through African, Sephardic and Arabic influences, the Romantic era through to today’s innovations. Like the singers of flamenco’s genesis just 170 years ago, Lorca represented his deep comprehension of humanity in all its struggles, and Cohen its vagaries. Creating a broad cultural awareness of the rich heritage of flamenco’s past with links to innovations in the present is our hallmark.. Observing metamorphic transformations in nature allows us to extrapolate that method to humans and the arts. That is to say, the foundational substance becomes a supporting substance retained in the new identity. These essential elements are absorbed, invisible yet to the observer, until the transformed form creates a stunning awareness of the new when loosed from its protective cover. Likewise, our compositions make use of a similar pattern of creative transformation, if you will. We begin with folk songs that poet Federico Garcia Lorca chose, rescued from oblivion, transcribed for the piano and performed in various venues. Following a trajectory that reveals their hidden elements, we submit them to an unexpected metamorphic process. The melodic essences of the old songs are those that give musical meaning to different poems that Lorca wrote. Additionally, in his short life, he created diverse artistic works, including poetry, music, and literature. He created formidable, yet popular, works for the theater, while also embracing other mediums such as painting. His contemporaries and artistic collaborators included Joan Miró and Salvador Dali. Our concert is conceived and presented by Fernando Barros, Melissa Moore, Tito Rios, Brian Nelson and Juan Aniceto is a collaboration inspired by Lorca’s example. Lorca collected melodies from the Spanish folklore repertoire and transcribed them for the piano. At differing stages of development artists acknowledge their homage to other artists, history, other cultures and, sometimes, their peers. Inspiration is related to those metamorphic stages – hidden until the time comes to be revealed as something new. Our reveal is that of the link between Federico Garcia Lorca and Leonard Cohen. A native of Granada, Spain, Fernando specializes in the unique cadence and rhythms that are the foundations of flamenco music. He has gained international recognition as an innovator whose voice and compositions reveal the “melody” inherent in Spanish literature and poetry, including Federico Garcia Lorca, Antonio Machado, Juan Ramon Jimenez and Miguel de Cervantes. Exemplifying the rhythms that give musical identity to cultures around the world, he draws on ancient texts and melodies, as well as composing with today’s audiences in mind. In 2017, Fernando inaugurated new courses on flamenco history, rhythms and vocal techniques through the auspices of the Instituto Cervantes of Albuquerque and Collected Works Bookstore in Santa Fe. He is honored to be an invited member of the International Council of Dance at UNESCO (No. 16955), which preserves indigenous dances from around the world. On the vanguard of integrating the traditions of flamenco with new approaches to teaching, Fernando has authored two books and a recently released instructional manual. He offers university-level master classes and workshops for life-long learners interested in Spanish culture and the authentic history of flamenco. He has performed in Spain, Morocco, Canada and the United States. Tito Rios was born in the city of La Paz, Bolivia, South America. He recognized the guitar as his musical instrument at the age of 8 years old, and has worked with this instrument ever since. At 12 he began his classical guitar training in San Francisco, CA, with guitarist Paul Binkley. Today, more than 30 years later, he faithfully continues to enjoy and develop his craft. Throughout his career he has won numerous awards, both in Bolivia and the USA, including an original composition award by Ballet Repertoire Theater of New Mexico, in 2010, where his music was choreographed and performed live. He has gone on tour in Bolivia, the USA and Asia, including touring with internationally renowned band Sukay, alongside Charango virtuoso Eddy Navia. In the Santa Fe area, he has performed in a variety of concert halls including The Santa Fe Opera House, The Lensic Performing Arts Center, Kimo Theater, National Hispanic Cultural Center, and GIG Santa Fe. He has also performed for private and public events at El Dorado Hotel, La Posada de Santa Fe, La Fonda on the Plaza, Hacienda Dona Andrea, and many other spaces. Tito has recorded many albums, and he continues to do so in different instrumentation and styles. He is also working on original compositions for guitar and other ensembles. In addition to performing, he shares his love for music with the community, in the form of presentations, workshops, and working with groups. He also does private guitar sessions. You can find more info about his work here: www.titoRmusic.com. and his profession. Originally from Lima, Peru, Mr. Aniceto grew up in Torrance, California and began playing bass guitar at the age of 16. Along with his close friends and bandmates, he became part of the local rock scene and performed in various LA venues including the famous “Whiskey a GoGo” in Hollywood and “Chain Reaction” in Anaheim. He continued to play music throughout Southern California for the next few years before his interest in Jazz led him to pursue an education in music. After studying at a local community college, Mr. Aniceto transferred to the University of Redlands, where he completed his Bachelors of Music Degree in Music Education in 2016. His time spent at the University of Redlands provided him the opportunity to meet and work with several well known musicians such as Richard Sherman, composer for Disney films including “Mary Poppins” and “The Jungle Book”, and Kevin Eubanks, the band director for the Tonight Show with Jay Leno. Mr. Aniceto now resides in Santa Fe, and is a teacher for Santa Fe Public Schools at Nina Otero Community School. He continues to play music with a variety of groups and has performed with local well known artists including Nacha Mendez in the 2018 Santa Fe Bandstand Summer Concert Series. When not working, you can usually find Mr. Aniceto at a local coffee shop or taproom, studying and practicing his orchestration with a music notebook and pencil in hand. A graduate of the Berklee College of Music, Brian Nelson has studied West African drum and dance at the Dagbe and Dagara Music Centers of Ghana, West Africa. In addition to touring the United States and Jamaica as a working percussionist, he has also worked as a dance accompanist for Boston University and University of Buffalo. Nelson has worked in a variety of musical contexts, from electronic dub reggae to folk ensembles, and has recorded on sessions for an array of clients including for Disney. 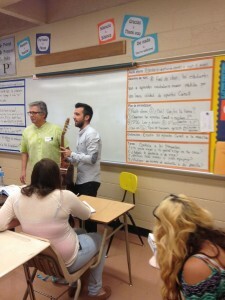 In addition to playing music, Nelson has worked as a music educator for over 15 years. He worked as an instructor of guitar, ukulele, piano and percussion for students from 6 months to adult, as well as directed the elementary age summer camps at the Swallow Hill Music School in Denver, CO, the second largest folk music school in the country. Currently he is the elementary music teacher at Desert Montessori School, and is also the Artistic Director of the Queen Bee Music Association, a nonprofit music school and concert presenter in Santa Fe. When not playing or teaching music, Nelson is also often writing about it as a primary contributor and content developer at the online music magazine Rootfire. Melissa Moore, a 25-year educator in the Montessori method, directed Desert Montessori School in Santa Fe, NM for 17 of those years. As a child of the Civil Rights movement, she was raised in a progressive family of activists in Memphis, Tennessee. She had the honor and deep privilege of being present at Dr. King’s, “I’ve Been to the Mountaintop” speech given the night before his assassination. Together with Robert Muller of the United Nations, she presented art works at Wainwright House in Rye, NY, on the 100th anniversary of the birth of the French paleontologist, Teilhard de Chardin. Her banner, “Those Who Were Our Lights,” hung at St. John the Divine in NYC for many years. Her newest works consist of a talisman series that are one-of-a-kind created in mixed media, two of which are in the collection of the author, Judy Blume. This experience of delving into the history of flamenco has as its foundation of her life-long immersion into education, research, leadership and fundamental curiosity about the connections readily made in the arts.